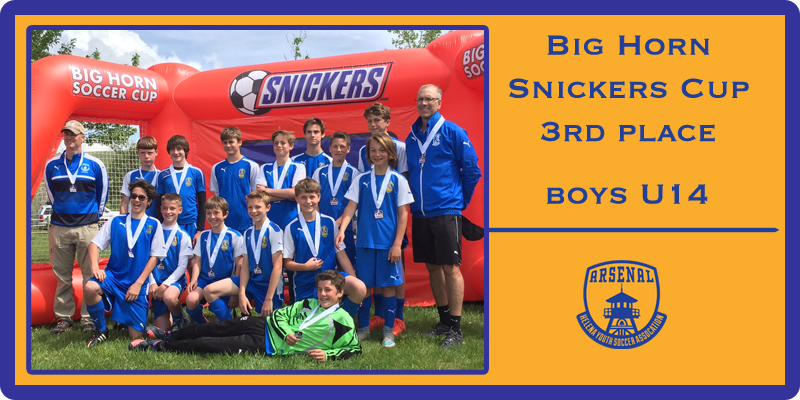 U14 Arsenal Boys Blue team coached by Andy Adamek, Josh Wilcox and Colby Smith traveled to Wyoming to compete in the Sheridan County Big Horn Snickers Cup Tournament on May 13-14th, taking home 3rd place medals after an exciting weekend of play. In game 1 against Billings Magic City White U14 Premier, Blue took an early lead with a well placed throwin to the box by Ethan Hayes connecting with Aidan Tonidandel at minute 9:08. Arsenal was then allowed only 9 more shots by a skilled and physical Billings backfield. Team defending and pressure by Blue limited Billings to only 4 shots in the second half, with their final shot at 5 seconds left hitting the cross bar and then pounded in on the rebound to equalize and finish in a disapointing 1-1 draw. Keeper Dylan Maharg kept Blue in the game with 7 saves. With this win snatched away in the final seconds Blue came out unfocused in game 2 to play to a 1-1 draw against host club SC Storm as it scored with only 95 seconds left in the game. Blue took 25 shots, finding the net only once in the 45th minute with quick central combining by Hayes to connect to left winger Tyler Jost on the run from wide. Keeper Maharg was credited with 3 saves in game 2. In game 3 Blue demonstrated its character after going down 3 goals by half against an older and polished Worland SC team (who went on to take 1st place at the tournament) . With halftime adjustments calling for midfield patience and loading to wide players Blue battled back to score 2 goals (1 by Tonidandel and 1 by Luke Sullivan). In what appeared to be a dramatic equalizer at minute 68 Sullivan was called offside after shaking the net. Valiant effort was demonstrated by the entire team in game 3, with standouts Josh Wilcox orchestrating possession in his defensive midfielder role and backfield players Casey Fladager, Shaun O'Brien, Dylan Hoogerheide, Nathan Adamek and Reid Jankowski repulsing blistering attacks by Worland, limiting them to only 11 shots the entire game with 4 saves logged by Maharg. Three games of perserverance paid off with a 1 point goal differential pushing Blue into the consolation final playoff game against the Casper Blades. Blue came out big in game 4 with its only goal scored by Charles McLaren 90 seconds into the game. It took an entire team effort of exhausted players to hold this nailbiting lead to the final tweet. Congrats Arsenal Blue!